Forget New Orleans, there is plenty to do here. Mardi Gras or "Fat Tuesday" is customarily the last day for Catholics to indulge before Ash Wednesday and the beginning of Lent. New Orleans has always been the place to be during the Mardi Gras season, drawing in visitors from all over the world with weeks of parades and parties leading up to Fat Tuesday. But if you think you have to go all the way to Louisiana to enjoy the Mardi Gras festivities, you are sorely mistaken. Connecticut has its own brand of celebrations that can’t be beat. Hartford: If you’re looking for something during the day on Tuesday, look no further than Black Eyed Sally’s. An all-you-can eat lunch buffet from 11:30 a.m. to 2:30 p.m. and happy hour specials from 4 p.m. to 6 p.m. are just the tip of the iceberg. There will also be stiltwalkers, beads and face painting, along with Rivercity Slim and the Zydeco Hogs, who will have you in the mood to dance the night away. When: Tuesday, Feb. 21; lunch buffet – 11:30 a.m. to 2:30 p.m., happy hour – 4 p.m. to 6 p.m.
Killingworth: If you’re looking for something more family-friendly, head on over to the Killingworth Congregational Church for a Mardi Gras Pancake Supper. The dinner is for all ages and is free, though a donation of $10 is suggested for all you can eat. The menu includes berry-filled pancakes, scrambled eggs, sausage, bacon and more. All proceeds go to the church’s general fund. When: Tuesday, Feb. 21, 6 p.m. to 8 p.m.
Middletown: Go down to Eli Cannon’s to celebrate their 18th year in business with all the pizazz that Mardi Gras has to offer. They will be unveiling a new menu and a new 18th Anniversary ale will be on tap. There will be a free crawfish boil and plenty of beads to go around. Where: Eli Cannon's Tap Room, 695 Main St. 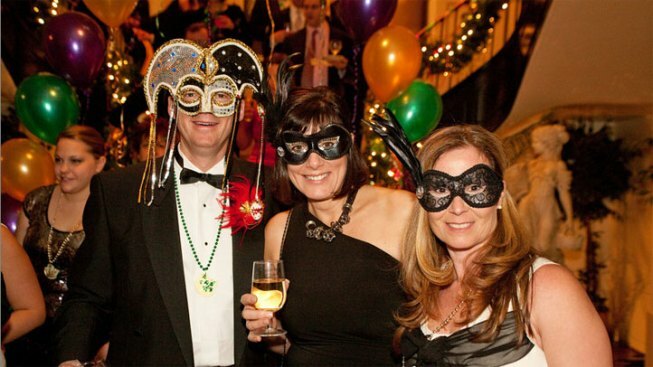 When: Tuesday, Feb. 21, from 4 p.m. to 11 p.m.
New Haven: For those who want to celebrate a cause on Fat Tuesday, go to the New Haven Free Public Library Foundation’s Mardi Gras 125 Gala and Silent Auction. The event begins at 5:30 p.m. on Tuesday, with cocktails and live entertainment. Food will also be served in celebration of the date the library system first opened on Feb. 21, 1887. Silent auction items include a South Africa photo safari for two, breakfast for four with U.S. Senator Richard Blumenthal, a behind the scenes tour of the United Nations and more. The proceeds from the event go to support children and youth programming. Where: Main Library, 133 Elm St. When: Tuesday, Feb. 21, 5:30 p.m.
New London: If you’re looking for somewhere to wear your best Mardi Gras costume, the New London Main Street’s Inaugural Mardi Gras Masquerade Ball is where you want to be. Though costumes are optional, there will be costume prizes and masks will be available at the entrance to the ball. Planet Zydeco is set to play and is offering a free Zydeco dance class. Traditional New Orleans-style food will be served and don’t forget the King Cake – it wouldn’t be Mardi Gras without one. The ball is also a fundraiser for New London Main Street, a group dedicated to improving downtown New London. When: Saturday, Feb 26, 6 p.m. to 10 p.m.
South Norwalk: Donovan’s is celebrating its Annual Fat Tuesday Party on Tuesday with drink specials, a Mardi Gras-inspired Cajun menu and giveaways. Hi-Def televisions and a full bar make Donovan’s a must-stop spot, especially when they offer happy hour from 3 p.m. to 7 p.m.
Uncasville: Mohegan Sun’s three-day “Carnivale” reaches its peak on Tuesday in a tribute to New Orleans. The Shops at Mohegan will be transformed into Bourbon Street and celebrations start at 2 p.m. With entertainment including jesters, jugglers and a live DJ, guests will get a taste of what Fat Tuesday is like down south. But don’t forget the indoor parade beginning at 9 p.m., which includes puppets, music and performers led by a king and queen. When: Tuesday, Feb. 21, 2 p.m. to 11 p.m.